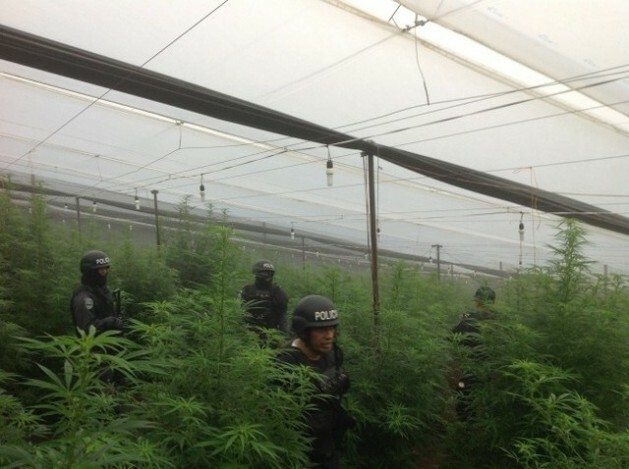 Police raid on a greenhouse where marijuana and opium poppies were grown in La Cumbre, in the Honduran municipality of La Iguala. Credit: Courtesy of Policía Nacional. LA IGUALA, Honduras, Mar 15 2014 (IPS) - Discovery and destruction of an elaborate greenhouse for growing opium poppy and marijuana on a western hill, La Cumbre, has alerted the Honduran authorities to the fact that this is no longer just a transit country for illicit drugs, but also a producer and processor. This is the first time that opium poppies have been found in this country. Previously, the only place in Central America where they had been recorded was in the Guatemalan region of El Petén. Opium paste is the raw material for making heroin, which is highly addictive and is re-emerging as a drug of choice. On Jan. 31, the authorities announced the discovery of the high-tech greenhouse on the steep mountain, 1,600 metres above sea level and 400 kilometres from Tegucigalpa, in the hamlet of La Cumbre in the municipality of La Iguala. IPS visited the place, which is reached by tracks that are barely passable by rural vehicle and on horseback. On the way up the trail went through five hamlets, and wound between wild flowers and coffee plantations, typical for the department (province) of Lempira. The roads were creviced and narrow, wet and muddy; they become impassable in the rainy season that begins in May. At the end of the trail, the remains of the greenhouse came into view. It was 100 metres long and 40 metres wide, and 1,800 opium poppy plants and 800 of the Dutch variety of marijuana (cannabis) were found there. The enclosed area was air-conditioned, with a large generator, a modern irrigation system and high-efficiency equipment. Two people were captured during the operation, Rubén Darío Pinilla, a Colombian, and Orlando Jacinto Miranda, a Honduran. Miranda worked for Pinilla, and grew vegetables on his farm as a “front” for his illegal activities at the greenhouse, Mejía said. Another police officer present during the raid told IPS that the registered owner of the land, a local person, is being investigated, and that he himself might be fronting for someone else. It is assumed that crops of opium and marijuana have already been harvested here. “For some time now, we have seen four-wheel-drive vehicles on these bridle paths at night, loaded with plastic barrels, and people have been saying that marijuana was being grown on that hill, but this opium poppy business is news to us,” the teacher said. The mayor of La Iguala, Marcio Orlando Miranda, told IPS that Pinilla had been arrested in July 2013 for illegal logging in the forest close to the greenhouse, but strangely, he was freed. “There was collusion with the authorities,” he insisted. Pinilla is in prison awaiting trial for drug trafficking, while those responsible for freeing him last year are under investigation, and a prosecutor has already been suspended. La Iguala is a municipality of 27,000 people, where maize, beans and particularly coffee are grown. There is only one police post, with five poorly-equipped officers, to serve its 26 villages and 86 hamlets. The operation that dismantled the greenhouse was organised from Tegucigalpa by the National Police anti-drug squad and was headed by the Lempira branch, which is also very short of manpower, equipment and vehicles in the fight against powerful drug traffickers. The authorities suspect that in adjacent provinces like Ocotepeque and Copán, which border on Guatemala and El Salvador, there may be more opium poppy plantations. Lempira also shares its southern border with El Salvador. In February the police found what appeared to be a clandestine laboratory in the Nueva Arcadia region of Copán, that was suspected of being used for cocaine processing, together with underground tunnels, heavy machinery and a helipad. Nueva Arcadia and La Iguala are both economically depressed zones located among tree-covered mountains. But they are not the only indications that the drug trade is changing its spots in Honduras, which has been a transit zone since the 1970s and is now a country where drugs are grown, processed and even, to a lesser extent, sold. Eugenio Sosa, a sociologist and university professor, told IPS that Honduras “has for a long time ceased to be a transit country. There are indications that drug trade penetration is much deeper than that, and growing opium poppies only reflects one of the forms of organised crime. “The authorities seek to present these discoveries as a success, but one has to ask: are more drugs seized because more are being trafficked, because they are being produced and processed, or because the authorities are more efficient?” he said. “I have my doubts about the last of these possible answers,” he said. Mirna Flores, an expert on security issues, attributes the expansion of drug-related crimes to displacement of the trafficking routes due to the war against drugs in Mexico, which has prompted the cartels to dispute territories in Central America. “Honduras’s geographical location appeals to the cartels and they have become more sophisticated in their expansion strategies, based on corruption and impunity,” she told IPS. The Atlantic cartel, on the northern Caribbean coast, and the Valle cartel in the west are the main drug organisations operating in this country of 8.5 million people. Analysts say the opium discovery will compel the government to crack down more effectively on the smaller cartels operating in the country, and on their political and economic bosses. Official reports say that 80 percent of illegal drugs en route towards the lucrative United States market through Central America pass through Honduras, and connect this with the country’s having one of the world’s highest levels of violence, with an average of 19 violent deaths a day. According to the United Nations Office on Drugs and Crime (UNODC), in 2012 Honduras had the highest homicide rate in Latin America, at 81.9 per 100,000 population. Most of those who meet violent deaths are young people, and although criminal investigation is fragile, the nature of most of these murders leads criminal experts to believe that they are the result of cartel turf wars and score settling.